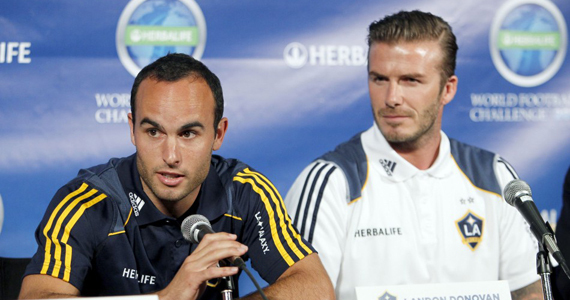 Jobu discusses the impact that Landon Donovan’s career has had on American fútbol. I guess my question is… Is Landon Donovan’s career worthy of the legacy it seems he will leave behind when he retires? We’ve known Landon Donovan since he was sixteen years old and, over the last ten or twelve years, he really has become the face of fútbol in the United States. His path to the top of American fútbol started in 1999, when he won a Golden Ball trophy at the U-17 World Cup (USA finished 4th). He soon signed with German team, Bayern Leverkusen, which I remember being a pretty big deal. Other players from the United States had played in the Euro leagues before, but I remember Donovan’s signing making big waves, probably because of his performance for the U-17 World Cup team, which had pretty much made him an overnight sensation. 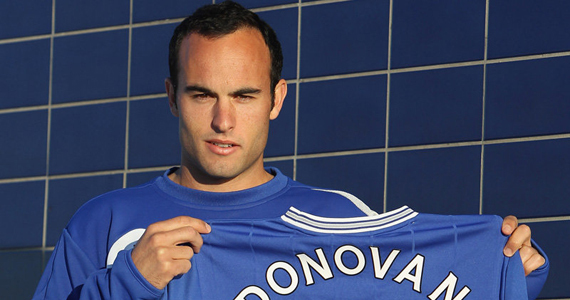 Unfortunately, Donovan found himself very unhappy in Germany, and was loaned out to the San Jose Earthquake of the MLS for most of the time he was under contract with Bayer Leverkusen. In San Jose, Donovan quickly began cementing his legacy as the best American fútballer of all time. He wasted no time in leading San Jose to the MLS Cup title that very year (2001) and then again in 2003. He was even named U.S. Fútbol Athlete of the Year in both 2003 and 2004, making him the first ever two-time consecutive winner of that prestigious honor. After a short return to Bayer Leverkusen, Landon came back to the MLS, this time with the Los Angeles Galaxy (while back in Leveruksen, L.A. had been able to obtain his rights). Donovan picked up his MLS career where it had left off, leading the Galaxy to the MLS Cup title. In 2008, he had his best season (20 goals, 9 assists) but the Galaxy missed the playoffs. In 2009, Donovan was named the MLS MVP, and he took the Galaxy to yet another MLS Cup final (they lost). Landon is currently third all-time in MLS scoring with 114 goals, 19 behind all-time leaders Jamie Moreno and Jeff Cunningham. Because Moreno has retired and Cunningham is now 34 years old, there’s a good chance that Donovan will be the all-time leading scorer for the MLS by the time all is said and done. In international competition, Donovan has not really shown anything different from what he has shown domestically in his career. As I mentioned before, his first big splash came when he was representing the United States in the U-17 World Cup. He won a golden boot trophy and led the US to it’s best finish ever in the tournament. When he played his first big boy World Cup, in 2002, he was named the tournament’s Best Young Player. In 2006, he returned to the World Cup, but the Americans were eliminated in the group stage. He then led the US to a Gold Cup title in 2007, and back to the World Cup in 2010. This is where he finally had his signature moment on the world’s biggest stage. In the last game of the group stage, the US needed a win over Algeria to avoid going home before the knockout stages for the 2nd straight World Cup. The game remained tied through the first 90 minutes of play, and the ref indicated four minutes of stoppage time. Like Madonna and Justin Timberlake before them, The United States had four minutes to save the world (cup). Donovan started a counter-attack after a near goal by Algeria. After taking the ball most of the way across the field, he fed Josy Altidor, who crossed it to Clint Dempsey in the box. Dempsey was unable to get much on the ball before tripping over the goalie, but he got enough that it was deflected towards the middle of the box. Donovan, still running from before, came streaking in and pounded the ball into the corner of the net for the most dramatic goal in US fútbol history (at the time… remember Wambach?) In all, Donovan is the all-time leading scorer for team USA with 35 goals. He is also the all-time assists leader for team USA and the active leader in games played. and is widely considered the best player in United States international play history. Is The Legacy Bastardized In Any Way? So… He’s the probably the best player in MLS history and the best player in the history of team USA. Is there anything else left to prove for Landon Donovan? Believe it or not, some say yes. With his MLS successes, Landon has always been a huge fish in a very small pond. Frankly, the MLS does not even compare to the Euro leagues when it comes to talent level and level of match play. As the great Ric Flair said many times, “To be the man (Whoo! ), you gotta beat the man.” Landon Donovan has never even really attempted to tackle European fútbol. When he was under contract with Bayer Leverkusen of the German Bundesliga, he spent most of that time states-side with San Jose and Los Angeles. He’s only really played in Europe one other time, a thirteen game loan to Everton of the English Premier League in 2010. The fact of the matter is that he has never proven himself on that type of international stage, and a lot of people will see that as his biggest shortcoming as a player. Furthermore, when David Beckham signed to play with the Galaxy in 2008, Donovan relinquished his captaincy for the British import. Only when Beckham was loaned out to AC Milan did Donovan got his captaincy back. Then there was the whole controversy where Landon basically said the Galaxy didn’t need Beckham to come back, and then apologized for airing dirty laundry to the media. The argument could be made that Donovan immediately became second fiddle on his home town team. Would this happen to another legendary player? To me, it really doesn’t matter that he never went to the Premier League or the Bundesliga and dominated those places. He chose to stay in America and help establish and popularize an entire league. Without him, would anyone really care about the MLS? How many other MLS players can the average American even name? Overall, His dominance in Major League Soccer, and his great work on the international platform (which I consider the biggest stage in fútbol) is enough to prove that he’s the best American fútbol player ever and worthy of the legacy that he is sure to leave this sport with when he retires. Would it have been cool if he went to the Premier League and outscored Joe Rooney or even someone like Luis Suárez? Of course it would have. Does he need it to cement his reputation or legacy? Not at all. Maybe he just likes playing in America. He has spent his entire MLS career in California, his home state. In America, he has become a legend. Playing in Europe, he would have been just another great player on a continent filled with great players. Also, when he has gotten a chance to play in Europe he has held his own. Everton even asked to extend his loan after his playing time there came to an end, but the Galaxy denied the request. Then, they didn’t have enough money to offer for a legitimate transfer the next time around. As far as the Beckham stuff goes, there is no doubt that bringing Beckham in was huge for the MLS. If Donovan had really just refused to give up his captaincy, or made a really big stink about things, it would have been bad for the league. Donovan basically took one for the team, aka the league, and let the British invade for a little while. He still won the MVP that year, and Beckham was subsequently loaned out to an Italian team. In my eyes, that’s not a big deal. It takes a true leader to step aside when he needs to for the greater good. The moral of the story is that Landon Donovan is the best player in the history of American fútbol, and he has nothing left to prove. By the time he retires (he’s only twenty-nine years old), he will probably hold every important MLS and team USA record there is to hold (except the goalie records, unless he decides to play goalie from now on). If and when he goes to the European leagues to play, he will probably instantly become the best American in whatever league he chooses to play for (sorry Clint Dempsey). Even if he never goes back to Europe, he’ll still have his legacy, because he is the face of American fútbol, and will be until he hangs up the cleats. His country needed him to stay here and build a league for them. They needed him to bring a face to the national squad too, and he has done everything he’s been asked to do for his country and his sport. That is the legacy of Landon Donovan, and that’s why he won’t be forgotten any time soon.